Everyone talked about the Samsungs, Sonys, Intels and other tech biggies who wowed the world at the recently held International Consumer Electronics Show (CES) 2013. But very few people seem to know that an Indian startup has also made its presence felt at the high profile event. The company is emo2 Inc. and the products launched there included emo2 Anywhere, a multi-user, touch-interactive operating system, as well as a cloud platform. 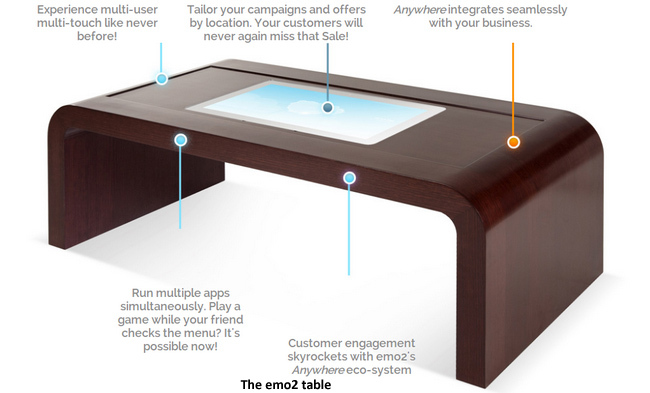 Set up in February 2011 by Mir Abid Hussain (CEO), the startup builds hardware and software to bring inanimate surfaces (like a restaurant table) to life. Simply put, it has developed a multi-user touch technology tabletop that can be used in a cafe, pub, lounge or a restaurant (for the uninitiated, let us explain that it is a touch-sensitive input device that allows multiple users to interact intuitively). The startup has already sold its application to the premium coffee chain CafÃ© Coffee Day (CCD) who piloted the earlier version of the emo2 solution in Bangalore. It is now deploying around 100 more emo2 software-enabled tables across its stores in Mumbai, Delhi and Bangalore. The company is also in talks with prospective US and Indian clients. Hussain is a serial entrepreneur and right after college, started an advertising agency called ideia.estudio. Next, he set up a product company called Zoyid. He holds a B.E. in Computer Science from Anna University in Chennai and an MBA from Chennai Business School. Currently headquartered in San Francisco, emo2 has an office in Chennai and is looking to shift base to Bangalore by March 2013. Right now, it has a 10-member team including the founder, but will increase the staff strength to around 50 in the next six months. It also raised an undisclosed angel round in August last year from Blume Ventures, as well as from Google India MD Rajan Anandan, Zafar Baig (senior software engineer at RSA Security Inc.) and two others. "We have shifted our primary focus from India to the US market, considering the scope there. Also, we can get better revenue shares (for ads) from US companies," said Hussain. The earlier version of the company's OS offered services like universal login (customers going from one store to another can log in to any emo2-enabled devices and continue from where they have left off) and selected ad display. 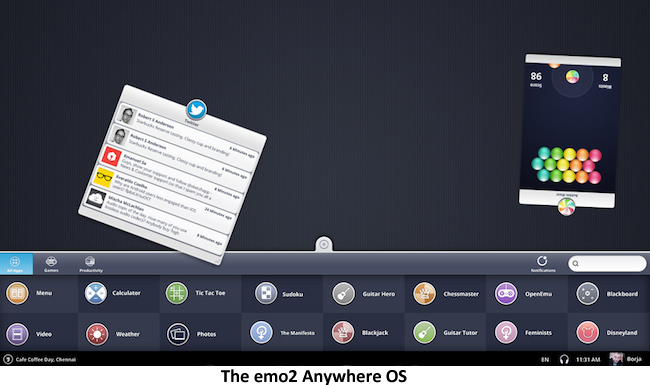 But the new OS called emo2 Anywhere offers a lot more. Now businesses can engage with their customers in a number of ways including menu updation via cloud; relevant and targeted advertising; appeal to a happy customer to 'like' the business page on Facebook or tweet about an experience; free games and apps (made by the company, as well as third party developers) and a dashboard for cafÃ© management to try different pricing options for various branches, depending on the demand-supply curve. It is a solution for large-scale deployment and management of multi-user touch systems, and addresses the need for multi-user collaboration. In addition, it is a cloud-based OS, which means it can be scaled up or down as required to deliver the best experience â€“ be it a million systems or a single home computer. "With emo2 Anywhere, hardware is not the focus. Hardware can be hidden in any of the real-world objects like tables and walls. Or it can even be our tablets and mobile phones. At this point, we are focusing on the OS, which is the biggest differentiator for us," said Hussain. Each 21.5 inch emo2 hardware unit will be priced at less than $2,000 (Rs 1.09 lakh). It will be also available in 27 and 32 inch versions. Going forward, the startup also wants to deploy emo2 Anywhere in segments like education, healthcare and architecture. It is also looking for third-party developers and partners to implement custom solutions for specific domains, using the cloud platform and the emo2 software development kit (SDK). As for competition, the company will face off with Lenovo that has demonstrated a similar offering at the CES 2013 event. "Our biggest advantage over Lenovo is that it is using Windows 8 software for the devices, but we have built our own OS, which gives us a lot of control and flexibility," explained Hussain. The company generates revenues from hardware and software sales, as well as from targeted advertisements (it does a revenue share with its clients for the same). It is also planning to offer paid apps in the future. Keep track of this space for a hands-on review of the company's offerings. Meanwhile, if you happen to visit a CCD in Bangalore that has a table laden with emo2 hardware and software, do share your experience with us. CES 2013 Cloud emo2 Anywhere emo2 Inc.